Bone Suckin’ Sweet Hot Mustard, 8 Tbsp. Preheat oven to 350 F. Cut bacon strips in half and place on parchment paper lined baking sheets. Roast for 20 minutes, until almost crisp. Transfer bacon to paper towels to drain and cool. Drain baking sheets and replace parchment paper. Heat oven to 400°. Place one shrimp on a piece of bacon and add ½ teaspoon of Bone Suckin’ Sweet Hot Mustard. 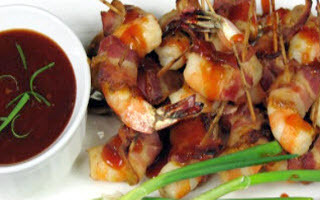 Wrap bacon around shrimp and secure with a toothpick. Place wrapped shrimp back on baking sheet. Bake 10 minutes. Remove from oven and drizzle with Bone Suckin’ Sauce. 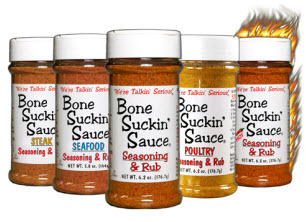 Serve with Bone Suckin’ Sauce to the side for dipping. Recipe serves 8.